Have you found an online vendor selling Westerhall Plantation? This is not a great rum but is still drinkable. It's a raw rum with nothing flavour wise added. Still has a decent body but just doesn't rock my world I'm afraid .. I like this rum. The aromas of freshly baked pound cake and vanilla cream are tempered by fairly strong, but not unpleasant, alcohol overtones. The cake comes through in the tasting along with pepper, vanilla and honey. Very nice. Deceptively light in color and body, but there's a lot going on here. One comment before I offer my opinions on the rum. I like bottles with wax seals. Gives the bottle an "old school" appeal. But apparently my bottle got a double-dose of navy blue wax making it pretty difficult to open. However when I got it open, I smelled the opening to see what lay in store. It smelled more of plastic but I quickly concluded that aroma was from the double-dose of wax seal rather than the rum itself. Even in a glass the aroma was very subtle...almost nonexistent. This rum was recommended to me by the clerk in the Port St. Joe, Florida liquor store. He said this rum was the only thing the owner of the store drank and so I purchased a bottle since they didn't have the brand of rum I was looking for. This rum is about as golden in color as one can find. Definitely an initial sweetness in flavor followed quickly by some spiciness then the burn...a long, slow burn (it's 43% ABV). Interestingly enough once the burn finally faded I noticed a woodiness to the flavor I presume is from the oak barrels in which it is aged. I can see why the owner of the liquor store likes this so much. Although not my favorite, I feel this is an excellent rum which happens to be extremely versatile. Makes for a good sipping rum as well as a mixer. It definitely adds a good flavor to Coke Zero. Great go-to rum for those quiet times. Smooth body, wide profile that will always please. I was at the ancient structure the rum is made in about thirty years ago. An amazing place to see. You walked into the past when I was there. It was small, intimate and very basic. A true artisan rum. I have bottles that are from that time. The rum is a true sipper. If you don’t rinse the glass the next day it has a nose of pure butter scotch. With it's pale golden colour, this rum looks more like a Chardonnay wine than a rum. The blue waxed bottle top gives this rum great packaging. Opening the bottle, the rum had only a very faint alcohol citrus scent... Sipping it straight was possible, although it provided little flavour and was accompanied by a slow burn. Easy to drink with an ice cube and some coconut water. This rum tasted like no other rum I've tried, although I can't say that I would recommend it. Tried the Westerhall Estate Number 10 and Westerhall Plantation Rum back-to-back. The Number 10 rum earned a 7 whereas the Plantation has a much stronger alcohol smell and taste to it. The color is also much lighter than the Number 10. The Plantation struggles to earn a 5. I had to waiver a little, but in the end, I'll agree with the majority. The color was very golden. The sweet is very inviting with a banana cakey syrup sweetness. Very long legs and slight alcohol on the noise. And nothing to my liking once on my mouth. I thought maybe I should try it with a snifter. To no avail no improvement. I add a droplet of water on one occasion and with a ice cube on the other. Nothing improved. I was torn between getting this or plantation 5 year. Well the top broke off while trying to open the bottle,annoying but no biggie. I mixed it and that's when it showed up for the party. O well I wanted a low level sipper but this will do for my mixing. Join your brother pyrat XO and black magic in the mixing cabinet. It's getting better. On the nose I notice banana and Citrus. Smooth going down. I'll revisit it again. Smooth and light with a nice warmth. Smart move bottling it above the standard 80 proof. It's far to smooth to be a slight 40% The extra kick adds some excitement yet remains an easy spirit to sip. Carmel vanilla and wafts of banana and citrus. Not overly sugary nor dry. An all around non offender. Being just so, a snob might mistakenly think it mundane. Quite the contrary. It's a rum that falls into the realm of standards. A measuring stick, a starting point and I imagine not an easy feat to achieve. When you go too far one way or the other this is a rum that will bring you back to the core of what a well crafted golden rum is and should be. Deserves more than 8 out of 10 but sometimes your mecca lies beyond the realm of standard. 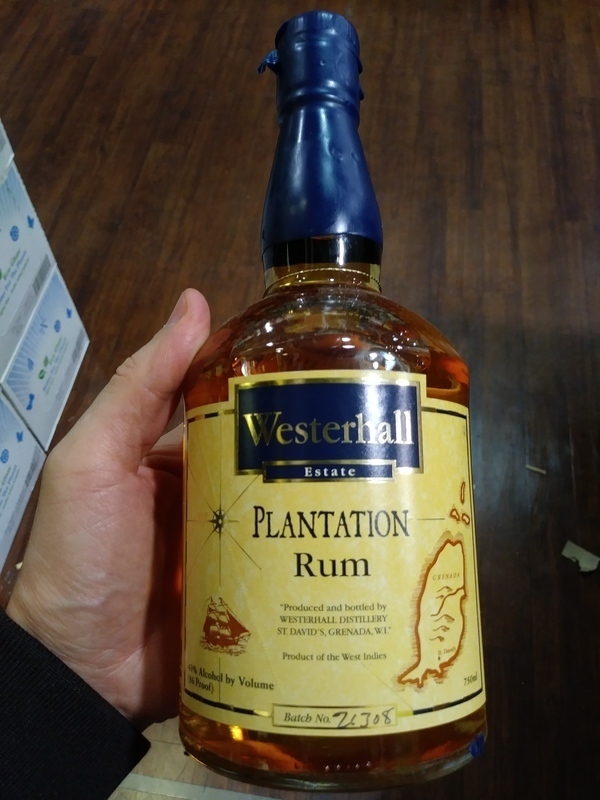 Westerhall Plantation is not that sort of rum but saying so is not a knock rather an admiration. maturation de 6 ans en chene americain de bourbon. Thought I'd give this on a try as it's affordable, has spent a few years ageing and isn't loaded with sugar or crazy amounts of colourant. It's not half bad either, nose is light and hints at the time spent in charred oak, you get the taste of that tobacco too when you drink it alongside some mild acidity and an overall bittersweet vanilla flavour. It's ok, especially if you're partial to a drop of sweet Bourbon and the odd cigar. This rum is very flavorful and blended well. Fruit on the nose, with lots of spice and some citrus flavors going on. Very smooth overall and easy sipper with a nice kick. Batch number 21308. Blue wax over real cork top. Wax smelled like pine trees and smoke. Hard to find but if you see it don't miss the opportunity. Better than many rums that are twice the price. It's a particularly good summer rum. Very refreshing and light with a good accent on vanilla and caramel. You'll pick up a hint of banana too. This rum is exceptionally smooth and is recommended for newbies and more experienced palates alike. This was my first time drinking a light rum on the rocks. My first word was wow you can taste the caramel. This would definitely be good mixing with a coke or in a mixed drink. Great profile, hints of caramel, nutmeg, and vanilla. Extremely smooth and very flavorful for a light- dark rum. I first tasted this rum at the Bitter End Yacht Club in the BVI's and due to the excitement of the day of small boat sailing and a breezy day of hiking, I really loved it. This proves that many things impact your taste buds as I'm not nearly as enamored with this rum at home as I was standing in a open beach bar staring out across the sea. Bottle: A classy update on old school labels including the melted wax over the syn-cork topper. It has a nautical look without looking out of date. I like the bottle a lot. Bottle Aroma: I rarely see anyone say that a rum has a maple syrup nose or flavor to it, perhaps that is looked down upon, but not to my nose. I really like the smell of this rum, it makes me want to make a concoction for serving with waffles. Glass Aroma: The rum now steps out behind the cognac like smells in the bottle and you have a pleasant presentation that is building expectations. Taste: When it first hits, you immediately have heat but give it time as it will dissipate and leave you with a layer of sweet flavor that slowly dries and become oaky with hints of other spices. What a great little rum. I like this rum and I obviously loved it when we first met. But there is something about that hit of heat that turns me off and the final aftertaste does not make me want more. I suspect that second comment is specific to my palate and other drinkers will not experience this rum the same. I recommend trying it though, you might find it on your shelf afterwards. This is a pressed sugar cane rum which surprises me a little as it has little of the agricole flavors I would expect to come with it.